Here’s another extra long strip to make up for the lack of update on Monday. My computer is inoperable for the time being, so I’ve had to use someone elses computer to put this together, hence the slightly rubbish quality. When I can use my computer again I’ll replace it with a better scan. Oh noes! Are they going to hob-nobble him? LMAO! OM NOM NOM NOM! not only ink, but also a lot of glue. I might still eat them anyway. I really hope you don’t eat those cookies. So, this is probably one of my most favorite things I’ve ever seen. I love this one. I’d have to say it’s my fave My Cardboard Life strip by far. “Bland” biscuit looks like he was drawn on. Did you draw on him? No I didn’t draw it, they’re all real. It’s a digestive biscuit, but I turned it over because it was easier to draw the face on on that side. I felt compelled to come back and reiterate that today’s strip is probably one of my most favorite things I’ve ever seen. 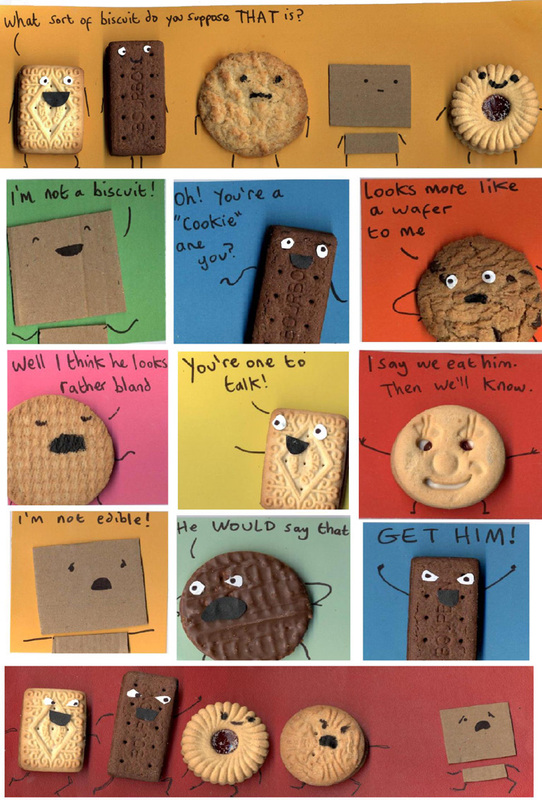 Oooh biscuits! What a great idea! Excellent! It’s nice to see you branch out past just cardboard now! I also saw your FML feature, without looking at the name I was like Wow that looks just like cardboard life and BAM it was you! So congrats on finding a nicht and sticking to it! You’re going places! Oh my god is that a bourbon cream? I love this comic ten times more now. I’ll have a cookie now. I don’t mind that they have glue and ink all over them, I’m just really hungry. Buahaha! GET COLIN! I bet he wouldn’t taste too good! YES!! This strip is awesome! this reminds me of alice in wonderland when she’s with the flowers. Yeah, you’re right. Especially the part when the flowers/biscuits talk about what kind of flower/biscuit is Alice/Colin, and when Alice/Colin ran away from the flowers. This is my favourite comic strip of all time! Nice work!